So many of us want to travel the world, taking in the sights and sounds, experiencing adventures in far-flung places, right? But travel is expensive, the kids are in school and there's no time to get away...it's hard to actually go anywhere. So if you're looking for a taste—and I mean this both literally and figuratively—of exotic locales, you just need to get this new cookbook. And Ally herself is full of so much joie de vivre. Her voice is strong throughout the pages of her book; joyfulness and passion practically leap from each page. On a personal note, she has been both a role model and mentor to many food bloggers, including me. I am incredibly greatful for her generosity of spirit. 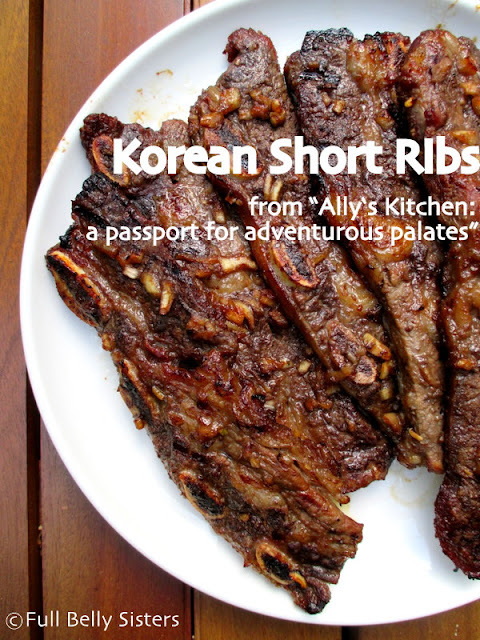 There are so many gorgeous recipes in this book; I chose to make her Korean Short Ribs. It's a dish I've loved in restaurants but have never before made on my own. I'm happy to report it was not only a delicious dish but a very simple recipe to follow. My short ribs, marinated and ready to bake! Heat oven to 400 degrees. In a large zipper bag, mix together the soy sauce, brown sugar, apple purée, pear purée, onions, water, garlic, rice wine vinegar, salt, pepper, chili pepper flakes, ginger powder, and sesame oil. Add the short ribs and marinate for at least an hour. For even more intense flavor, let them steep in the marinade in the refrigerator overnight. Remove ribs from marinade and place them in a single layer on a rimmed baking sheet. Pour marinade over the ribs. Bake 20 minutes. (Everything can be done up to three days ahead at this point; simply cool and refrigerate the baked ribs until ready to grill.) When ready for dinner, heat up your grill to high. 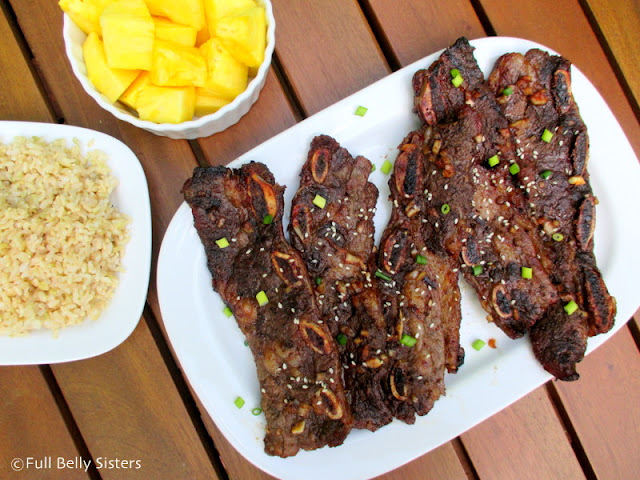 Grill the ribs 3-5 minutes per side and and garnish with sliced green onions and sesame seeds. Serve with hot, cooked rice. 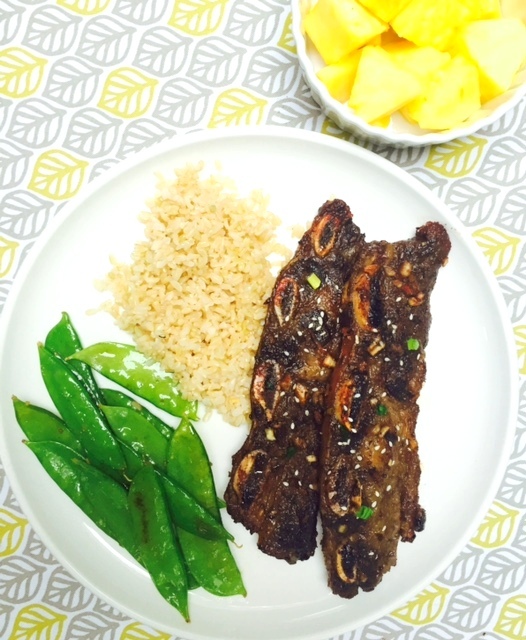 I served my short ribs with some brown rice, seared snow peas, and raw chunks of pineapple. It was a lovely balance of flavors, temperatures, and textures and was a perfect summer dinner! It started pouring so I had to rush everything indoors and just snapped a quick pic of my plate with the snow peas! Not great lighting, but you get the idea, right? I just want to end with a little funny story. When I made these short ribs, I posted a photo of them on my personal Facebook page. There were lots of comments about how delicious they looked. One comment was from my friend/neighbor, whose grilled pizza dinner had just been ruined by the thunderstorm. I told her to swing by and pick up our leftovers! 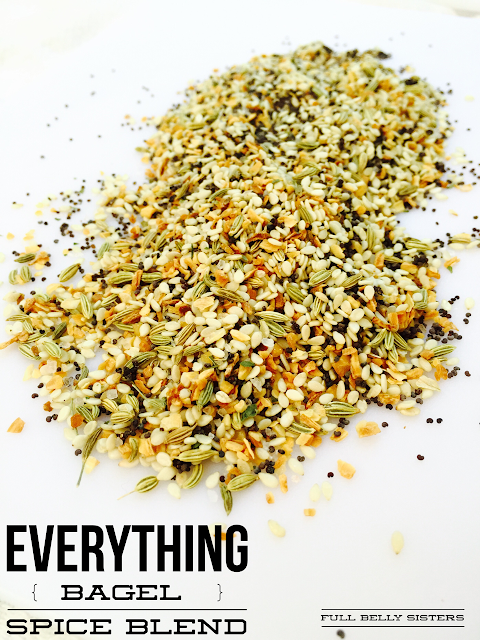 It seemed a great way to honor the boho spirit of food, fun, and friendship that is the core of Ally's cookbook. Where would you most like to travel, if money and time weren't a concern? Looks delicious! I have never made short ribs, though I've seen recipes that make them in the slow cooker. Would you do that with these? The cookbook looks like fun! I've slow-cooked short ribs before (like for a ragu) but that's a different type of cut. This galbi/flanken cut is butterflied, so it's long and flat; it's meant for grilling, I believe. from wiki: "There are numerous ways to butcher short ribs. The ribs can be separated and cut into short lengths (typically about 2 inches long), called an "English cut"; "flanken cut" across the bones (typically about 1/2 inch thick); or cut into boneless steaks." I was the lucky recipient of these delicious ribs after the dinner I was attempting drowned on the grill! I had my MIL visiting and, well, first of all she was amazed that I live in a town where spare dinners were available via Facebook, but secondly she loved them as well and has been asking for the recipe. Lots of flavor but nothing overwhelming, even my three-year-old took a bite! I've always been afraid to try to cook short ribs because they seemed mysterious and complicated but I will definitely be using this recipe all summer! 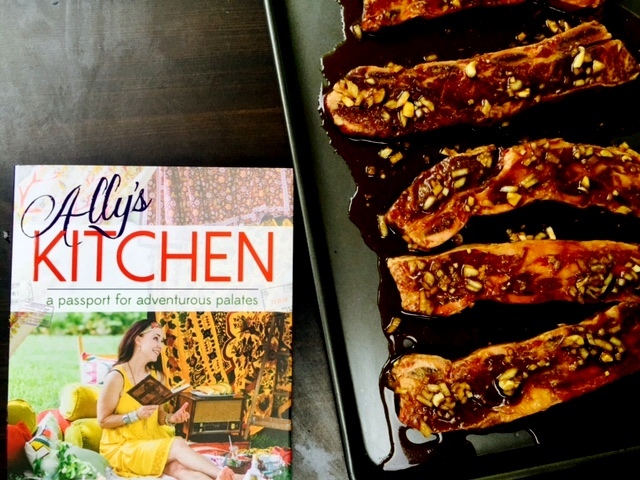 *This* is exactly what Ally hoped to inspire through her cookbook... a foodie adventure... making it your own... sharing with others. What a delightful review, Justine! Thank you. And thank you for the kind words, Kim!